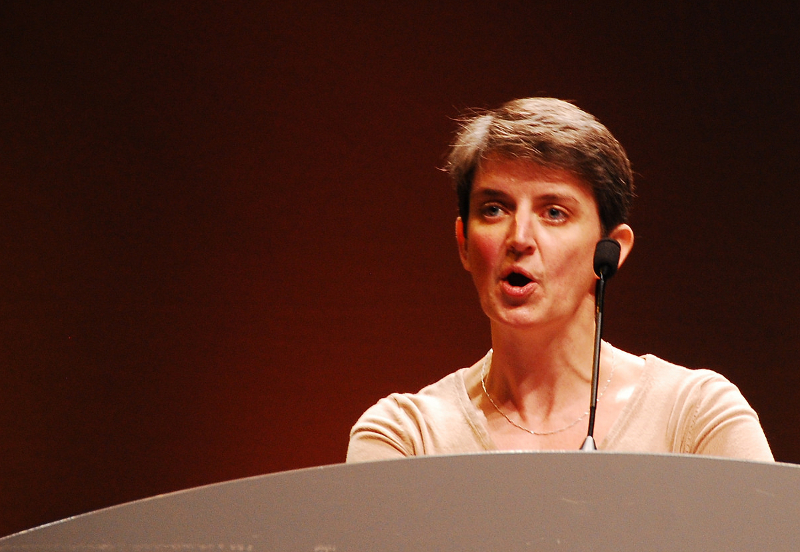 Co-convenor Maggie Chapman addressed a Scottish Green Party Conference that saw the party welcome a record number of Green Councillors and MSPs. Here’s what she had to say. It really is so good to be here with you all, after quite a year. And it is great to be speaking after Kim and the others who have been so inspiring in their local campaigning. It is good to be reminded that more Council chambers than ever before have Green voices in them. I was thrilled to hear that Pippa Hadley won a seat on Highland Council, that Steve Sankey is the voice of the greens in Orkney, and that Alasdair Tollemache was elected in Stirling to carry on the work Mark Ruskell has been doing. 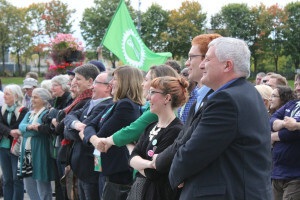 And of course, to see the green voice in Edinburgh and Glasgow grow stronger, with Mary, Claire, Susan, Alex, Kim, Christy, Jon, Tanya, and Allan joining the existing groups in Scotland’s two biggest cities. And I am so pleased that Claire is here too, sharing her story about her wonderful campaign earlier this year. The failures of the British state and the disaster of Brexit are perhaps clearest in Northern Ireland. And in the North of Ireland we see so clearly the need for Greens and for our approach to politics. Claire, you are dearly loved by your friends in the Scottish Greens – many of us were anxiously #AWAKEFORBAILEY as your count went on, and on, and on. I know that many of us are really looking forward to the moment when you join Caroline Lucas in the Westminster Parliament – the way the numbers look, you will be the next Green MP. Bring it on!! But back to here, now, in Scotland. It is somewhat strange for me being back in this particular building – I used to lecture here – so I am programmed to talk about feminism, social justice and environmental philosophy in front of this microphone … for two hours. I’ll try and contain myself! Before I start though, I am delighted that two emergency motions, both very close to my heart, were passed this morning. I want to make it very clear, on behalf of our party that we are appalled by the actions of the Spanish state in Catalunya. It takes a lot to make the UK government look like they’ve done something right, but beating citizens on the ways to the polls is not something we expect to see on our continent. I hope we never do again. And hearing the news this morning that Robert Mugabe, the person who has overseen the social, health and economic decline of the country of my birth, has been appointed a goodwill ambassador for the World Health Organisation, just makes my blood boil. We have so much work to do to change the world. This is our quest. And for us to do these things, we need to recognise that it is not just about MSPs and councillors, or even political parties. It is about working alongside our friends and neighbours in the wider movement. With this inclusive approach to politics, our belief that our politics and our economy can and will be different. Now, as we all know, it won’t be easy, but before long other parties will be parroting our ideas. Ideas like an end to assaulting a child on the grounds that it is physical punishment. A campaign that originated in social movements and which I think we’ll all want to congratulate the wonderful John Finnie on delivering. I’m delighted that John was able to secure Scottish Government support for this in time for conference. Timing truly is everything. And I’m also delighted the Young Greens are launching a much needed campaign on mental health. The crisis in mental health is one of the greatest indictments of our system. It needs a system change. And system change has always been what Greens are about. In the 1970s a small group of people believed that that peace, feminism, anti-Imperialism, social justice, gay equality, nuclear disarmament, and the reality that we depend on the environment for our society and economy was so important it needed its own political movement. Since then we’ve come to see that this way of seeing the world cannot survive alongside free-market fundamentalism. At its heart our politics remains unchanged. But another ideology emerged at that time – neoliberalism – the idea that people are subservient to the market, which has done so much to set our world back. The last 40 years has been a struggle between our ideology and the ideology of the wealthy elite. All the other parties have been neoliberal. Some enthusiastically, some because they couldn’t, or wouldn’t, see the alternative. Now the UK was always going to be a difficult place to make this politics succeed. First past the post makes it difficult to get a toe hold, and we didn’t have the parliamentary route open to many other green parties. But we made a difference. And we did that through social movements. For women’s rights, against nuclear weapons, for gay liberation, and for devolution to Scotland. With that campaign for devolution we were finally able to get the parliamentary platform we now enjoy. A strong, focused campaign in Lothian delivered the UK’s first ever Green parliamentarian, and after 4 years of optimism, people gave us 7 MSPs in 2004 because they wanted us to shake the place up, to bring cooperation into Holyrood and move away from the ya-boo politics of Westminster. Our MSPs in that term diligently worked on the important issues, but with a settled coalition, they were prevented from bringing the change to the culture that was so desperately needed. In 2007, when we had the opportunity to join a government, we could have done what so many others in a similar position did: gone into government and traded influence, and principles, for a comfy ride in a ministerial limo. 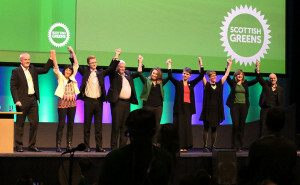 Instead, we stuck to our principles and our values, and ensured that those who voted for us were rewarded with real change instead: the Climate Challenge Fund that saw radical projects spring up across Scotland, and the first Green legislation in the UK, which recognised that a crime can be aggravated by prejudice, giving more protection to minority groups. What we discovered was that you didn’t need to be a minister to make a real change. At the same time, we had the opportunity, for the first time, to create real change at local government level. And we did that. We were able to crack open the bureaucratic monolith and get Councils to introduce participatory budgeting in Leith and Leith Walk. A small step, but one that has since been expanded across Scotland. The movement for participation is now found throughout our country. And this is just part of the work underway to create the kind of empowered communities we want, where people feel they belong. Many of you will know that when I first moved a motion on Living Wage in Edinburgh, opponents got it confused with the minimum wage. Now it’s Scottish Government policy for all public procurement. We stood for election saying that we could make a big change, even with a small number of representatives. That has proved to be true. We need to make the case that with a bigger number of representatives we can make an even bigger change. Then came the real struggle – the struggle for wider societal involvement. In 2011 we were cast our greatest challenge yet: an SNP majority meaning there would be an independence referendum, and we needed to take our supporters with us on our belief in independence. Remember: at this time many Green voters didn’t believe in independence. This was a real risk for us. We can look at other parties whose opportunism and self interest has done them enormous damage in the period since the referendum and see that our decision to throw ourselves wholeheartedly into the Referendum Campaign with Green Yes, was the right one. We were able to use Green Yes to communicate much better than ever before the full range of green politics. Green politics is about democracy, so we wanted, and still want, an elected head of state. Green politics is about power resting closer to people, so we wanted and still want a Scottish currency. Green politics is about peace, so we wanted, and still want Scotland to be a world leader in getting rid of Nuclear Weapons and dismantling NATO. Green politics is about equality, so we wanted, and still want a citizens’ income. And green politics is about an economy that works for all, so we want an economy that does not bleed our environment dry. At this point, many more people than ever before realised they were really Greens. And we were delighted to welcome them, you, with open arms, to our party. Since 2014, since our engagement in the Independence Referendum where we first got the opportunity to tell people about Green Politics in its fullness, in all its glory, we have continued to make the case for a better Scotland in a better world. When we first put the case for a Universal Citizen’s Income that would recognise for the first time the tough unpaid work, often caring work, that so many women do each and every day, and that would end poverty at a stroke, people were confused: one Labour politician confused it, believe it or not, with the tax free increment. We have discovered that, by sticking with a policy that is right, however little known, we, along with social movements, can get it recognised by government. For years, Green councillors and MSPs have called for socially owned energy companies. I’m delighted that the Scottish Government has decided that this is possible after all. I’m only sorry the people of Edinburgh have had to wait the 10 years, since we first proposed it, for the ability to buy not for profit energy. Similarly, we have argued for a national investment bank to support socially transformative changes such as community renewable energy. And we have been campaigning to bring our railways back into public ownership for years … finally it looks as though we might be getting somewhere on this. At first they ignored us, then they laughed at us. Then they fought us. Then they put it in the Programme for Government. Nicola, there are plenty of other good ideas in here [waves Holyrood 2016 manifesto] feel free to nick them too! It hasn’t just been on our good ideas that we’ve seen change. It is also the bad ideas of others: I’m delighted to see that the policy with no justification – the tax cut for frequent flying businessmen – cutting Air Passenger Duty has been kicked into the longest of long grass. Let me tell you a secret: they won’t admit it, but they were scared of us, and the pressure we’d put on over on this issue. And as if that weren’t enough, I am aware of all the work that so many of you have done, working with local campaigns, with social movements, to create the indefinite moratorium on fracking. Let’s leave the debate about whether that’s a ban or not for another day, and bask in the victory that we, yes we, have won. Faced with an unprecedented assault on immigrants, we stood up. In 2014 we ran the right campaign for the European Parliament. By standing on an overtly pro-immigrant platform we shifted the debate in Scotland – we can build belonging within and across boundaries, within and across racial and cultural differences. We pushed the boundaries of debate. We ensured, as we always will, that those who think they can scapegoat migrants, will never go unchallenged. We helped create a different political environment in Scotland compared to the toxic, imperial-nostalgia-fest we see emanating from the British state. When the European referendum came – just a month after our Holyrood vote – we threw ourselves into a humane vision for a better Europe. And in Scotland, we won. But where other parties have conceded the ground on immigration, the vote was lost. And now we see Conservatives trying to use Brexit as a giant axe to demolish everything we hold dear. From workers rights to environmental protection, the Tory approach is wrong in policy. Their attempt to seize back control, not for the people of Britain, but for the old ruling class – is the opposite of our belief in democracy. But I am confident that Brexit is the death throes of an ideology whose time is over. This is our time. It is time for workers’ rights, time to protect our environment. Time for real, participatory democracy. Time for an economy that puts people before profit and communities before corporations. Looking ahead, we have a great deal of agreement in Scotland about the future that we want. We are, to coin a phrase, getting on with the day job of creating a better country. Meanwhile, the Scottish Tories are best epitomised by their new MP for Moray, Douglas Ross. When asked what he’d do if he was prime minister for a day, Douglas Ross said he’d demand tougher enforcement against Gypsy and traveller communities. Gypsies and travellers were murdered alongside Jews in the Holocaust. They face persecution across Europe. In Scotland, a unique and wonderful traveller culture is on the verge of extinction, driven to the brink by bigots like Douglas Ross. Well, Douglas, let me assure you, you’ll be back on the sidelines of Scottish politics soon enough. The progress in Scotland could not be more different to what we see at Westminster: while we are nationalising the railways, Theresa May is leading a train smash government. Ruth Davidson has the nerve to tell Scottish politicians to get on with the day job while her government appears to think its day job is to create a circus. And short of an invitation to join the circus that is the Tory cabinet, Davidson has accepted an invitation to go on Bake Off. Just as people quickly went off Theresa May when they realised what she was, and are seeing through the buffoonery of Boris Johnson, I fully believe the same thing will happen to Davidson, who is really just another Tory that the media is trying to persuade us to love. Let’s not let anyone forget that this is someone who thinks her government’s policy of humiliating women who’ve been raped is just fine; who thinks that leaving people to starve for 6 weeks for no reason while they await Universal Credit payments is alright; and whose party is using Brexit to do as much damage to both workers’ rights and the environment as they can. The devastating effects of these policies mean we must carry on the fight to abolish austerity, to abolish alienation. And I just want to mention one consequence of austerity: the public sector pay freeze, highlighted so passionately to Alison, Patrick and me by nurses and the RCN yesterday when we met them to hear what issues they faced. Nurses caring for our friends and family, for us, doing some of the most vital work in our society, are 14% worse off today than they should be, alienated from decision making and demoralised like never before. This is neoliberalism in action. And it must stop! So, our journey to the new kind of politics, the better country we want is far from finished. We are still fighting neoliberalism, from schools policy in Scotland, to global trade deals. We face to two of the biggest crises in human history: an economy that is morally bankrupt, and an environment that is in big trouble. It’s at this time that the world most needs our approach. We must abolish alienation, we must build belonging, we must create communities. If anyone has the answers to these two problems, with one cause, it is us. And it is our responsibility to step up to that challenge, that quest – now more than ever. It is no longer enough just to stop the bad things like cuts to Air Passenger Duty. We have to create an economy powered by renewables, designed by communities, that works for all, not just in Scotland, but across the globe. We have started this vital work. We need to see it to its conclusion. The markets that have done so much to protect fossil fuel companies and their pollution must be transformed into systems that protect people and support their, our, ability to care for each other and express our creativity in ways that provides solace for our souls. We need to make sure it is our vision of an economy for all, a welcoming society, an end to inequality and discrimination that wins. And our approach of tenaciously supporting what is right, however unpopular with the establishment, being unswayed by the baubles of office or the fads of the day, is more important than ever. It is difficult to predict what is coming next in our politics but we know that we have the ideas, the roots in social movements, the courage of our convictions, the principles of social justice and equality. And in us, the people, the platform to transform our politics, our society, our country and our world. And I am so pleased, and honoured, to be able to lead you, as your female co-convener, in this quest. Maggie is Co-convenor of the Scottish Greens and lead candidate in the North East at the 2016 Scottish Parliament elections.